If you are missing one or more teeth, Dr. Cain may determine that a dental bridge is the best way to restore your smile and oral function. 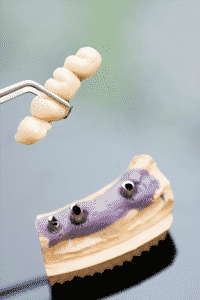 A dental bridge is a fixed dental prosthetic that only a dentist is able to remove. A traditional bridge is anchored to a patient’s mouth by abutments — the two teeth on either side of the gap. The bridge consists of one or more false teeth that are flanked by two dental crowns. The bridge is secured to the mouth by the crowns, which are anchored to the two abutments. Patients having a dental bridge placed first come in to have their abutment teeth prepared for the prosthetic. Dr. Cain removes a small amount of enamel from the abutment teeth to create a space for the crowns to be secured. At this first appointment, he also will make impressions of your teeth, which he will send to a dental lab to create a custom bridge. Once the bridge comes back from the lab, you will come in to have it secured to your teeth. After you wear the bridge for awhile, Dr. Cain will ask that you return so he can check to make sure it fits properly, and that you are comfortable with it. Patients who want to restore their missing teeth have several options, including full or partial dentures and dental implants. A dental bridge may be the most affordable way to address one or a few missing teeth. If you have questions about the pros and cons of one treatment approach over another, Dr. Cain is happy to answer them. To make an appointment, contact Healthy Smiles in Gary, IN, today by calling 219-938-2637, or by emailing our office at info@healthysmilesnwi.com. 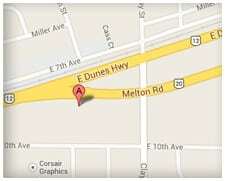 We also proudly serve the residents of Gary, Miller, Miller Beach, and all surrounding communities.